If you’re a loving and responsible pet parent, you want to look after your dog as well as possible, making sure they’re healthy and happy. It’s impossible to be in full control of your dog’s health, as illnesses and injuries can just happen, but one thing you can control is what your pup eats. Choosing a high-quality food that your dog thrives on can make a huge difference to their health. But, with so many options out there, which should you pick? This is a tough one because there isn’t a one-size-fits-all answer. A top-quality food that one dog thrives on might make another sick. Conversely, food that one person sees as cheap or lower-quality might keep a dog in perfect nutritional health. Although it’s important to do your research, you shouldn’t beat yourself up about finding the one perfect food because there are plenty of excellent options out there. Once you find a good quality food that fits within your budget and suits your dog, then you’re laughing! 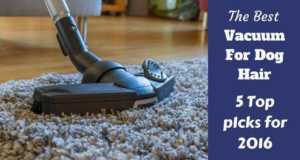 *The above links lead to current prices and customer reviews. 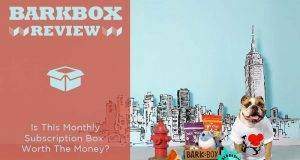 Read on to discover why we made these choices, and for buying advice to follow that will make sure you get the right product for your dog. 1 What Are The Best Dog Foods For Golden Retrievers? 2 What Makes A Good Dog Food? 3 Do Golden Retrievers Have Any Specific Dietary Requirements? 4 Is There One Best Dog Food For Golden Retrievers? 5 Should You Choose Wet Or Dry Dog Food? 6 Are There Any Ingredients To Avoid? 6.1 Should You Go Grain-Free? 7 How Can You Tell If Your Golden Is Thriving On Their Food? 8 What Should You Do If You Want To Switch Foods? What Are The Best Dog Foods For Golden Retrievers? Now that you’ve read the above, you should know a bit more about what makes a good dog food and what makes a bad one. However, you still might be feeling a little overwhelmed by all the choice out there. If you’re reading this as the owner of a golden retriever puppy, you should chek out our choices of the best food for golden puppies here. For adult goldens, we’ve selected a handful of what we think are the best dog foods for golden retrievers and discuss them in the rest of the article here. Of course, there are other great foods out there if none of these take your fancy, but we can’t list them all! If you’ve ever wondered about feeding your Golden Retriever a fresh diet but you dislike the idea of raw food and the dangers that can come with it, then you’re definitely going to want to take a look at what Nom Nom Now has to offer. The nutrition (and fun) begins when you choose which food you’d like to give your dog. 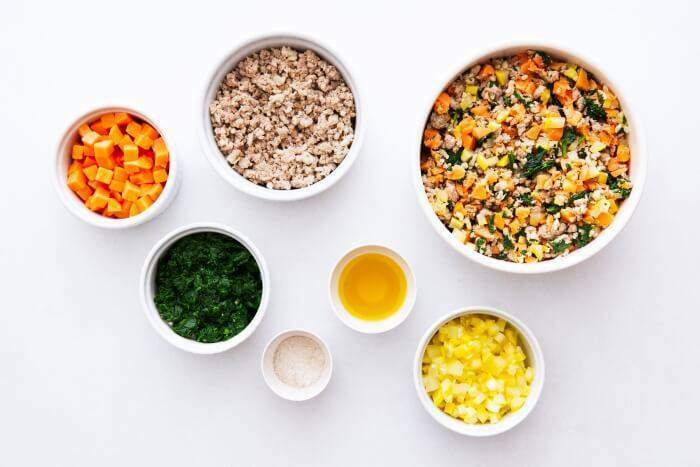 There are several recipes to choose from, all developed by veterinary nutritionists and cooked at Nom Nom Now’s on-site kitchen using fresh, restaurant-quality whole-food ingredients. Food is portioned based on your dog’s unique profile including age, weight, and any goals such as weight loss. You get a free consultation with a veterinary nutritionist when you order, so your golden gets exactly the right nutrients. Once your dog’s weekly menu is ready, food is sealed into single-serving packages, after which it is delivered to your home under refrigeration for optimal freshness. Just like your own fresh food, you keep your dog’s meals in the freezer or refrigerator until mealtime. Simply open a pack, serve it up, and watch your pet enjoy every morsel. You can choose a single favorite, or treat your dog to variety packs. Convenience isn’t all this food has to offer. Like other brands that made it onto our list of the best food for Golden Retrievers, Nom Nom Now provides healthy meat-based protein, with no weird byproducts or questionable preservatives. The carbohydrates are all easy to digest, with sources including potatoes, sweet potatoes, brown rice, carrots, green beans, and other healthy veggies in each recipe. Every recipe is finished off with an expertly formulated nutrition blend that includes fish oil so your golden retriever’s coat stays soft, beautiful, and healthy. It took time for you to find your best friend, now you want to treat them to the very best nutrition possible. There are lots of great foods out there, and we’ve discovered another option that we think your pal will appreciate more than dry kibble. Ollie fresh dog food is made with human-grade ingredients sourced fresh from American and Australian providers. Fresh meat is always the first ingredient, and depending on the recipe you choose, your golden will be treated to tasty, nutritious additions like peas, carrots, potatoes, kale, berries, egg, fresh herbs, sweet potatoes, and more. Many of the recipes are grain-free – perfect for sensitive stomachs and tricky skin conditions. Every Ollie dog food recipe is formulated by a veterinary nutrition specialist with your dog’s dietary needs in mind, and every flavor is designed to meet the nutritional levels established by AAFCO Dog Food Nutrient Profiles for All Life Stages. 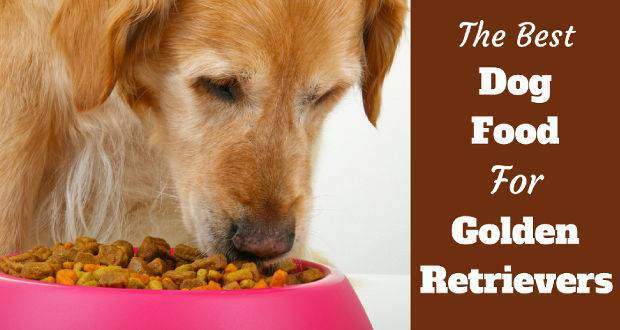 In laymen’s terms, that means your dog can enjoy this food from puppyhood until those later “golden” years in life! Every dog that eats Ollie dog food receives an individual plan based on their unique profile and any special needs. The food is delivered fresh, and it’s accompanied by a scoop that lets you get your dog’s perfect serving size ready with almost no effort. Fresh, healthy, and tasty, this food gets the Golden Retriever stamp of approval! 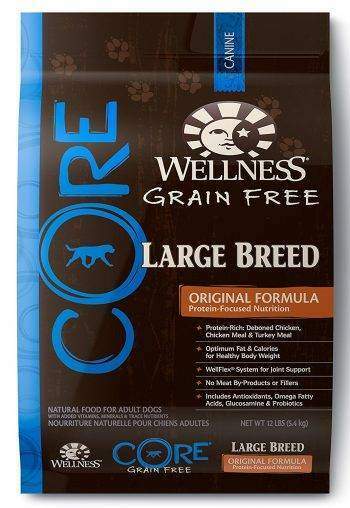 Excellent nutrition with added vitamins and extras such as fish oil for healthy skin and a gorgeous coat. 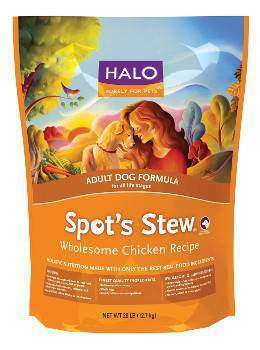 Suitable for all life stages, no need to switch food as your dog gets older. Very convenient weekly delivery plan, easy to store in freezer / fridge. 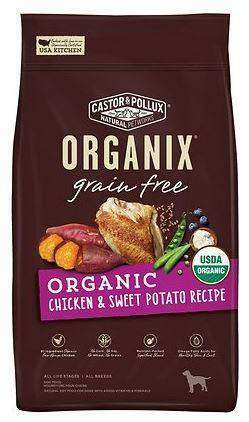 Slow cooked in New Jersey, using natural ingredients designed for humans but great for dogs. All the goodness of homemade dog food with none of the effort. Not packed in individual serving sizes like some other fresh dog foods. If you prefer to buy organic food for you and your family, you can include your furry family members on the list now, too. Made from predominantly certified organic ingredients and hormone-free meat, this quality dry kibble won’t leave you worried about the effects of pesticides on your pet. This is a popular food for a reason, and tends to get top reviews from almost everyone who has fed it to their dogs. It also offers good value for money, especially if you order it in larger bags. It’s made using chicken as a single type of meat, which can be easier on some dogs’ stomachs than having a blend of meats. It also contains fish, in the form of salmon meal, and some vegetarian sources of protein, including peas and egg. Healthy carbohydrates come from brown rice, barley and millet. Fruits and vegetables including broccoli, carrots and apples add some vitamins and minerals, but this food also contains chelated vitamins and minerals, which are easily absorbed and will make sure your dog is getting all the nutrients they need. The guaranteed analysis shows it contains 27 percent protein and 14 percent fat. We especially like that this is a large breed formula, as it should more accurately meet the nutritional needs of a golden retriever. 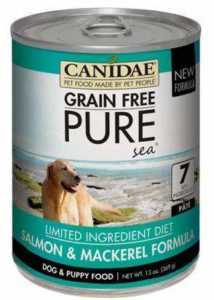 The Canidae PURE Sea Salmon and Mackarel Formula is perfect for those looking to find a high-quality wet food for their four-legged friend. It’s almost like a home-cooked meal in a can, composed predominantly of salmon and mackerel in fish and vegetable broths, with peas and sweet potatoes. However, the addition of vitamins makes it a complete and balanced food for your dog. So, if you want to feed wet food alone, this meets all your pet’s nutritional needs. That said, for a dog as large as a golden retriever, it would work out extremely expensive if this was the only thing you fed them. Unless money is no issue, it might be best fed mixed with a good kibble. While it is grain-free, there are adequate carbohydrates from the sweet potato. It contains above average protein and below average fat compared to other wet foods, so it could be good for dogs that have trouble staying trim. Sometimes it’s off-putting when dog food has a long list of ingredients, but when the ingredients listed are great for your dog, then the more the merrier. Then there are a large number of plant-based foods, providing both protein and a variety of vitamins and minerals. These ingredients include potatoes, spinach, broccoli, parsley, kale, apple, blueberries and sweet potatoes. This is a bit different from the other foods on our list, as it’s neither a wet food or a kibble. 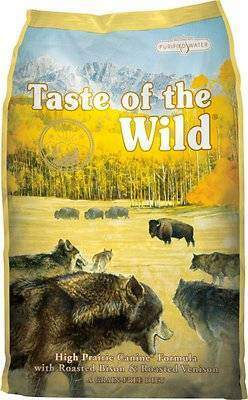 It’s a freeze-dried raw food that can be rehydrated to make it almost like a wet food. If you’ve ever thought of feeding your dog a raw diet, but have been put off by the hassle, this could be a great compromise. 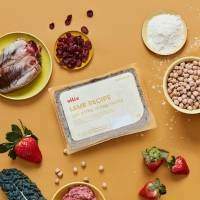 Composed of 77 percent beef and 23 percent plant-based foods and supplements, there are certainly no fillers or junk additives here. Alongside the beef, which is raised without antibiotics or hormones, you’ll find fruit and vegetables such as yams, kale, broccoli, apples and blueberries. What’s more, many of these plant foods are organic, which means fewer pesticides. According to the guaranteed analysis, it contains 48 percent protein and 38 percent fat. This sounds great on paper, and it is for many dogs, but it may be a bit too much for some, especially if they’re less active. It is understandable, due to the high-quality ingredients, but this would work out a very expensive way to feed your golden if they ate this for every meal. 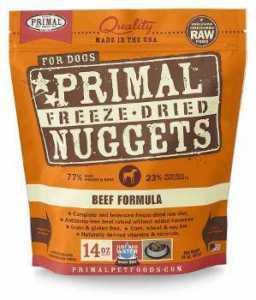 May be too high in protein and/or fat for some dogs, best suited to highly active dogs. Chicken and eggs make up the majority of the protein in this food, so it could be a good choice for a dog with a sensitive stomach. 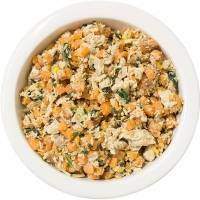 Eggs are an excellent source of protein for dogs, as they’re easily digestible. There are also plant-based sources of protein, coming from whole peas and pea protein. The focus on this brand is with wholesome ingredients, so there are never any artificial preservatives, colors or flavorings, nor does the food contain rendered meat. The carbohydrates come from oats and barley, both of which are good sources of fiber. Oats are also rich in B-vitamins. Other plant-based foods in this recipe add important vitamins and minerals. Fruits and vegetables include blueberries, zucchini, sweet potatoes, apple, green beans, carrots and cranberries. Flaxseed is added as an excellent source of omega-3 fatty acids and its also rich in easily-digestible soluble fiber. Inulin is added as a probiotic to make the food extra easy to digest. The added vitamins and minerals are chelated, which means your dog can more easily absorb and make use of them. According to the guaranteed analysis, the minimum protein content is 28 percent, and minimum fat content is 16 percent, which is more than sufficient for most dogs. Although some experts deem it unnecessary, another possible mark of quality is that the ingredients are suitable for human consumption. Do Golden Retrievers Have Any Specific Dietary Requirements? In some cases, it can be helpful to feed a dog food that’s suitable for the breed you own, so that begs the question, do golden retrievers have any specific dietary requirements? Well, yes and no. Of course, based on factors such as their age, weight and activity level, your golden will have specific calorie and protein requirements. Plus, some goldens may thrive on foods designed for large breeds. However, most will be perfectly healthy on a quality food designed for any adult dog. According to Dog Food Guru, the National Research Council of the National Academies recommends an active 70-pound golden retriever needs around 1700 calories a day. And the Association of American Feed Control Officials says they need around 18 percent protein in their diet (although this is the same for all adult dogs). So, you’ll need to pick a food that can meet these needs. 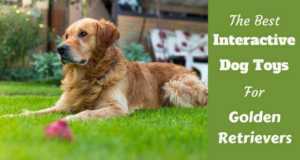 Both hip and elbow dysplasia aren’t uncommon in golden retrievers. Appropriate feeding during the puppy stage is deemed more important in preventing it than adult dietary choices. However, maintaining your golden at a healthy weight will help keep undue pressure off their joints. Is There One Best Dog Food For Golden Retrievers? There are hundreds of dog foods out there on the market, and many of them are of extremely high quality. You’re not so much looking for the one perfect dog food as you are looking for the dog food that best suits you and your dog. Don’t stress out over the decision, as it’s not hard to change brands if you find your dog isn’t thriving on the food you selected. Likewise, don’t go way over your budget just because you think you’ve found the perfect food. Sometimes the priciest brands out there are just the ones with the best marketing gimmicks. There are plenty of top-notch foods that come at more affordable prices. Should You Choose Wet Or Dry Dog Food? A range of factors may determine whether you choose to feed your dog wet food or dry kibble. Dry kibble is extremely popular as it’s convenient and affordable. It can also help with plaque build-up, as chewing on the hard pieces scrapes the teeth slightly. Wet food doesn’t last as long once you put it in the bowl and it requires refrigeration if your dog doesn’t eat the full can in one meal. In other ways, however, wet food is often superior. Because of the airtight packaging, wet foods don’t need any chemical preservatives and they’re easier to chew for older dogs. They’re often nutritionally superior, too. What’s more, many dogs find them more palatable, so they’re perfect for finicky eaters. To get the best of both worlds, some owners mix kibble with wet food, which is a good compromise. Are There Any Ingredients To Avoid? It’s certainly true that not all ingredients are created equal. But, unless you’re a nutritionist or a food scientist, it can be hard to determine what’s what. According to Dog Food Advisor, there may be some preservatives that could cause damage to your dog. They may be fine in the short run, but since you’d be feeding them to your dog everyday for their whole life, the cumulative effect could be cause for concern. Butylated hydroxyanisole (BHA) and Butylated hydroxytoluene (BHT): These compounds have been labeled carcinogenic by the World Health Organization. Ethoxyquin: This is also used as a pesticide and a hardening agent in rubber. The FDA is investigating whether it causes liver and blood problems. And it’s already banned in Australia and the EU. Propylene glycol: This is used to preserve the moisture content in some dog foods. It’s already banned by the FDA for use in cat food, as it can cause Heinz body anemia. Tertiary butylhydroquinone (TBHQ): Studies suggest that this preservative can cause stomach tumors in animals, as well as damage the DNA in cells. Propyl gallate: This substance contains xenoestrogens which are linked to breast cancer in humans. While it’s not 100 percent certain that these substances would cause significant harm to your dog, it’s better to be safe than sorry. There are plenty of foods that don’t use these kinds of ingredients, so why not go with them? It’s worth noting that there’s likely nothing wrong with natural preservatives, such as those containing the words the words “tocopherol” or “ascorbate.” Their job is simply to stop the meat and animal fats in the food from going rancid. What with the gluten-free trend in human foods, many dog owners seem to assume that grain-free foods are better for their dogs. However, according to Lorie Huston, DMV, there’s nothing innately inferior about foods that contain grains. In fact, grains are a great source of carbohydrates that are easily metabolized by dogs. Some dogs are gluten-intolerant or allergic to a particular type of grain. But, it’s more common for dogs to be allergic to a particular meat, or even meat in general. So, unless your dog has been diagnosed with an allergy to grains, there’s no reason to avoid them when selecting a dog food. How Can You Tell If Your Golden Is Thriving On Their Food? If your dog is getting itchy or flaky skin, vomiting or suffering from diarrhea, they might not be getting on well with their food. However, these issues could be caused by a range of other potential health problems, so take your dog to the vet for a check-up. What Should You Do If You Want To Switch Foods? Once you’ve found a food you think would suit your dog, you’re going to need to do the switch. However, as you may already know, it’s not the best idea to simply change from one type of dog food to another overnight. This can give your pup an upset stomach, which isn’t going to be fun for either of you. Start by replacing a small amount of the old food with the new food and gradually increase this daily until you’re feeding 100 percent new food. This gives your dog a bit of time to adjust. PetMD suggests doing this over five days, replacing 20 percent of the old food with new each day. However, if your pet has a particularly sensitive stomach, you can spread this out over a slightly longer period, such as a week to 10 days. One of the main lessons to take from this article is that there isn’t one single best food. Neither are there just five or ten best foods that everyone should be feeding. There are many high-quality foods on the market and all dogs respond to them differently. Therefore, you shouldn’t be too swayed by trends like grain-free, raw or biologically appropriate foods (though if those work your dog, then great). Just find something that keeps your dog healthy, they like the taste of and doesn’t have too many additives or chemical preservatives. That said, if you’re looking for a place to start, any of the foods listed above are made with excellent ingredients and should suit the majority of goldens. Please be aware this page contains affiliate links and TotallyGoldens receives a small commission if you make any purchases through any such links. This has absolutely no effect on the eventual price that you pay and we are very grateful for your support. try Acana Heritage Large Breed Adult, we also had skin issues with our golden Max, and after starting getting him this food he is now without any problems, more vital and healthy, his hair looks great. There is no grain in this food, and our dogs are meat eaters, so, why not get him the meat food. And acana is a pure meat (whole prey in it) and with some forrest greens, that the wolf for example can get in the wild nature. Max looks forward to every eating now. I hope this helps you.